Completely redesigned nose to tail, the GL1500 marked a new era for the Gold Wing, starting with its silky smooth, powerful new 1520cc flat six-cylinder powerplant, reverse gear and ultra-sleek styling. The result: A touring benchmark unlike any ever imagined. The GL1500 celebrates its sophomore year, continuing to be the full-dress luxury tourer of choice and class standard. The SE model joins the standard GL1500, bringing with it all the styling touches and creature comforts vented windscreen, rear spoiler with integrated brake/taillight, foot-warmer vents riders had come to expect from a Gold Wing. A touring trifecta comprises the '91 Gold Wing line-up, with the Interstate and special-edition 10th Anniversary Aspencade rolling up alongside the SE. First-class features abound, including illuminated switches, AM/FM radio and a chrome front brake disc cover (Aspencade only). This year's 'Wing featured a fully integrated 25-watt AM/FM audio system, complete with an output jack for headphones. Also available: GL1500 Interstate, GL1500 SE. Fine-tuning of the GL1500 trio continues, with an upgraded cruise control system and, in the top-of-the-line SE's case, an all-new CB radio and dual rear speakers. Also available: GL1500 Interstate, GL1500 Aspencade. Styling accents are the highlight this new season, reflected in the all-new color-matched lower bodywork panels. Also available: GL1500 Interstate, GL1500 Aspencade. A motorcycling milestone is reached heralding two decades of the Gold Wing. Honda celebrates with three commemorative Gold Wing models sporting 20th Anniversary badging to go with a special hard-cover book detailing the GL's 20-year legacy. 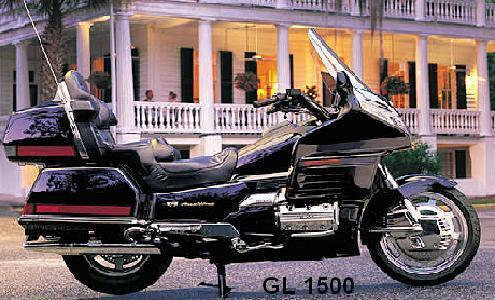 Also available: GL1500 Interstate, GL1500 SE. While an all-new full-logic audio system further enhanced the '96 Gold Wing's touring package, the new year ushered in even bigger news. One million Honda motorcycles had rolled off American assembly lines, and appropriately enough, that millionth model was a Gold Wing. Also available: GL1500 Interstate, GL1500 Aspencade. Popular as ever, the Gold Wing continues to burnish its luxury touring legacy as the new millennium draws near. Also available: GL1500 Aspencade. New-design cylinder head covers and white-faced gauges highlight aesthetic touches to the latest Gold Wing. Also available: GL1500 Aspencade. Honda Motorcycles pops the cork on its 50th birthday, commemorating this major milestone with special 50th Anniversary badging on all three Gold Wings. Also available: GL1500 Aspencade. The history-making revelry continues into the new season as Gold Wing enters its 25th year, memorialized with 25th Anniversary badging on the entire line-up. Also available: GL1500 Aspencade.